Each year, we like to set an intention for the whole team to focus on. For 2018, we chose : the year of today’s, not tomorrows. This was meant for each member to focus on the present, the here and now, and to make the most of each and every day. To not put off things for “later” or a better time. 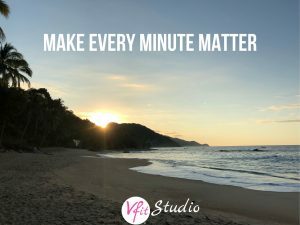 For 2019, we have landed upon another TIMELY quote, because at VFit, that’s what is at the core of our philosophy about fitness and life – truly making the most of each and every valuable minute you each have in life. That right there is where our focus will be for 2019, and starting today we are geared up to help YOU make each minute matter in your day. Your time is incredibly valuable – it’s the moments of each day that create the life you lead, and you have much more control than you may realize to choose how you spend those moments. This philosophy is the driving force of why our platform even exists. It was TIME that was the barrier between our founder Rachele being able to get back to the gym, along with the added complications of childcare, work, and the commute time to the gym. She just KNEW there had to be another way to get her workouts in. Exercise isn’t about fitting into a pair of skinny jeans or looking good for an upcoming event. Exercise has the power to transform EVERY other area of your life. We firmly believe this and so do our members. This value and love of what fitness does for the rest of our life, is why VFit is so successful. Exercise makes us all better people and should be possible for everyone to fit into their lives, no matter how busy we all are. When we couldn’t find another solution to replace everything Rachele loved about her gym (community, accountability, working out with others, support…. ),she took the leap of faith and began The VFit Studio. She rounded up two other instructors she knew would help with her vision, loaded up a first week schedule with roughly 20 classes, and got word out by reaching out to women she knew would benefit from having the ability to make each minute count. Because as many of you can relate, self care is oftentimes the first to go once we feel we have ‘no time.’ Once work gets busy, the kids schedule gets packed, and your to do list is a mile and a half long. At VFit, you don’t have to worry about that. Not EVER again. You just carve out 30 minutes of your schedule, you hold yourself accountability, and you log in to our live streamed classes. It’s 30 minutes start to finish, often less time than it would take you to pack yourself up and head over to your local gym. And heck, some days you may only get to log in 5-10 minutes and we know even that short amount can turn your day around and bring a world of different to your life. We are here to help you make every minute matter in 2019. We are here to give you the most effective, fun, safe workouts possible in 2019. We are here to ensure you reach that level of fitness that gets you out into the world, that allows you time to play, to be active and feel good in 2019. After all, what is all the stress and chaos of life worth if you can’t feel healthy, strong and ENJOY it! Exercise makes your strong inside and out! And it doesn’t need to take hours a day to reap the amazing benefits. If it’s simply ‘time’ that is truly the reason you are not getting in your self care and workouts, then it’s time to flip the script, to try something new and see how much you CAN do. This week our team is celebrating just how many workouts they DID fit in this year and the majority of our active members have logged in at least 100 workouts in 2018, with many hitting in the 200 and 300 range! Have you made time for YOU that many times this year? Because YOU are always worth it. So today we challenge you to make EVERY MINUTE MATTER. Whether you give yourself 5 minutes of time, or more – make the use of your time as valuable as possible.